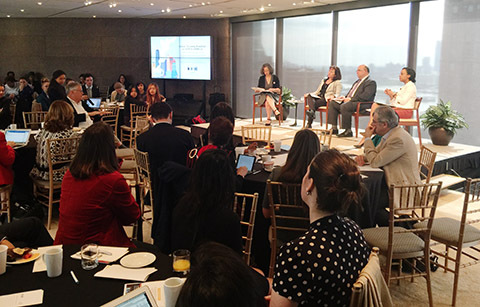 This month’s Urban Breakfast in New York, held on 19 May, put a special focus on urban challenges and sustainable development in North America. Urban Breakfasts are customarily held by the Habitat III Secretariat in collaboration with various esteemed partners every month to reflect on challenges facing sustainable urban development and key priorities to take into account in the New Urban Agenda to be adopted at the Habitat III Conference. They focus on introducing and discussing regional urban perspectives, with the participation of key speakers from national governments, local authorities, academia, civil society and the private sector among other stakeholders. In New York, a special series under Urban Breakfasts—Urban Thursday Breakfasts—has been organised in collaboration with the Ford Foundation, and has been held every month since its first session on 17 December 2015. Jacqueline Burton, Program Associate for Equitable Development at the Ford Foundation gave the opening remarks; followed by Habitat III Secretary-General Dr. Joan Clos, who expressed concern over the decreasing role given to urban planning and the palpable dip in housing affordability. Coming from the two-day Informal Hearings with Local Authorities held 16–17 May at the UN Headquarters, Mayor Vrbanovic shared his conclusions that the problems in each city may appear different but actually share many commonalities. He also added that Canada, under Prime Minister Justin Trudeau’s administration, is urban agenda focused. He added that change, however, does not happen overnight but through a continuous process that involves working together with the community. Assistant Secretary Harriet Tregoning says the United States is preparing for Habitat III by harnessing innovation as one of the key factors. Alaina Beverly stressed the importance of research, stating that since cities with limited resources cannot afford trial-and-error approaches. She also highlighted how universities can provide assets for the transformation of a city. The panelists were all in agreement in eliminating single-purpose projects and giving way to projects that could address multiple urban needs at a time. Other issues brought up were on the effects of gentrification, the advantages of suburbanization, prospective solutions from the private sector, and how to maximize scarce city resources in order to address as many challenges as possible. The next Urban Breakfast takes place on 16 June with a special focus on the urban challenges and sustainable development in West Asia.